The Zombie Autopsies, by Dr. Steven C. Schlozman – Book Review | We Zombie! Imagine you’re a researcher sequestered on an island in the Indian Ocean, tasked with performing autopsies on captured zombies. With most of the world devastated by the apocalypse, humanity’s only hope lies with you and your team coming up with answers – something that might turn the future into one that gives the world a chance at survival. Also imagine that you know you’ll probably get infected and die doing it, so you pull out all the stops and stop at nothing to find answers. 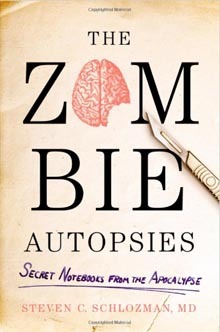 The Zombie Autopsies is a journal of the work of one Dr. Blum, the researcher you just imagined. It’s a hand-written journal, complete with pictures and gory details of the autopsies and experiments that were performed on the island. The journal takes you inside Dr. Blum’s head as he performs the autopsies on living zombies restrained on gurneys and held in cages. If you are a serious zombie fan, you’ll want to read this book…if you are a zombie newbie or just curious about zombies you probably won’t enjoy the book – it’s not an adventure book or a book to learn about zombies – this is a hard-core, gory zombie dissection manual.